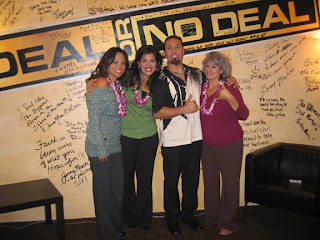 Liza's Eyeview: Deal Or No Deal - Congratulations Brad Falcon - What a Deal! Deal Or No Deal - Congratulations Brad Falcon - What a Deal! WAIKAPU – Waikapu resident Brad Falcon saw his win on NBC’s “Deal or No Deal” on Wednesday night as a way to broadcast the aloha spirit for the nation to see. And earning $260,000 wasn’t too shabby, either. Falcon, a 37-year-old home remodeler, was the first person from Hawaii to land a spot on the popular NBC game show hosted by Howie Mandel. The game tests the nerve of contestants faced with choices of dollar amounts hidden in briefcases or offers to settle before all the briefcases are opened. With his emotional highs and lows on display for a national television audience, Falcon ended by choosing a deal of $260,000. Throwing shaka signs and sending Maui shout outs – especially those aimed at his family – Falcon had the Los Angeles crowd laughing much of the time as he hammed it up onstage. Meanwhile, a group of about 40 friends and family members watched Falcon’s experience on a projector at his Waikapu Gardens home block party Wednesday from 7 to 8 p.m.
“If you know him for even five minutes, you can tell he’s really amazing,” said his former co-worker Yukio Kina of Pukalani during the start of the show. “Regardless of what he walks away with, he’s definitely going to be grateful.” .. Continue reading at Maui News here. Watch Him HERE, he's funny! That was fun to watch....what was in his case #5? Did he have the million? How fun to see someone you know on TV! I can't watch that show, usually, because the suspense stresses me out. How weird is that? I wanted to thank you for the support and the nice feedback you have on your blog I have been getting a lot of great comments ever since the show aired and my family and I are blessed to live in such a great place as Maui! Continue your great ministry through Liza’s Eyeview! I think he's week 15. No, there was no million in his case. All I can say is "Vacherin and I'm Pauuuuuuuuuuuuu!! You deserve it ....lots of love..
Brad would like to get in touch with you. Would you please e-mail me your phone numbers. I have his phone number and will give it to you when I hear from you.